Published: Jan. 23, 2013 at 10:23 a.m. 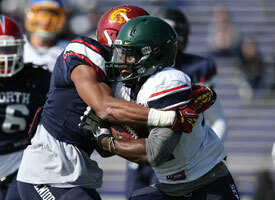 Updated: Jan. 23, 2013 at 03:54 p.m.
Day 2 at the Senior Bowl is in the books. 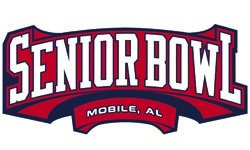 Tuesday and Wednesday are the two days of practice in full pads and the best days for evaluation in Mobile, Ala. If you missed ATL's Day 1 recap, check out the rules here. I'm just watching the coverage and seeing what I can learn from the experts. 1. N.C. State quarterback Mike Glennon hasn't stepped up this week. He's been erratic with his accuracy. NFL Network's Mike Mayock said he's been a little disappointed by the big-armed Glennon thus far. 2. Oklahoma's Landry Jones, on the other hand, has looked good according to NFL.com's Daniel Jeremiah. Jones can make all the throws and has shown improvement making plays after plays break down. 3. UCLA pass rusher Datone Jones had an up-and-down collegiate career, but he's consistently impressed with pass-rush explosiveness in Mobile. 4. Mayock absolutely loves Cal center Brian Schwenke. He's a zone-scheme center who probably isn't a first-round draft pick, but Mayock is a huge fan. 5. Mayock and Jeremiah love what they have seen out of Oklahoma tackle Lane Johnson. The former quarterback and tight end is wildly athletic. Jeremiah compares him to a better version of Nate Solder. Johnson might not be as polished as Central Michigan's Eric Fisher, but both Mayock and Jeremiah are convinced Johnson is a first round draft pick. They complimented his feet and propensity to finish plays with a nasty edge. 6. Rice tight end Vance McDonald is another favorite of Mayock and Jeremiah. McDonald moves very well; Mayock think he has a chance to be dominant. His hands could be McDonald's only weakness. 7. Washington's Desmond Trufant and Oregon State's Jordan Poyer have stood out among an excellent cornerback group. 8. Mayock called Michigan quarterback/wide receiver Denard Robinson one of four players with something to prove this week. Thus far, his transition to receiver and returner has been rough, according to Jeremiah.